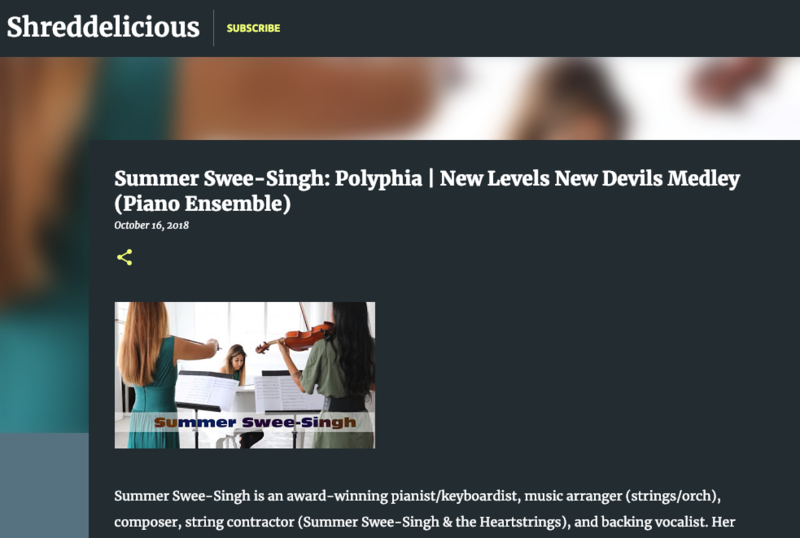 Summer Swee-Singh is an award-winning pianist/keyboardist, music arranger (strings/orch), composer, string contractor (Summer Swee-Singh & the Heartstrings), and backing vocalist. Her studio and touring credits include Circa Survive, KSHMR, Chief Keef, Anthony Green, Until the Ribbon Breaks, Alexandra Shipp, etc. ; her work has also been praised by Skrillex, Ed Banger Records, Carlos Rafael Rivera, DJ Paul KOM, Dustin Kensrue, Campa, etc. Summer’s arrangements as well as her original compositions can be found on iTunes, Spotify, Amazon, Google Play, etc. Summer is also known as “Piano DJ” due to her seamless transitions when arranging and performing; she often performs solo for luxury/celebrity weddings, corporate events, and at luxury resorts/hotels. More information about Summer at https://www.summersweesingh.com. Featured in Berkeley B Side Article, "Super Chon Homeys"